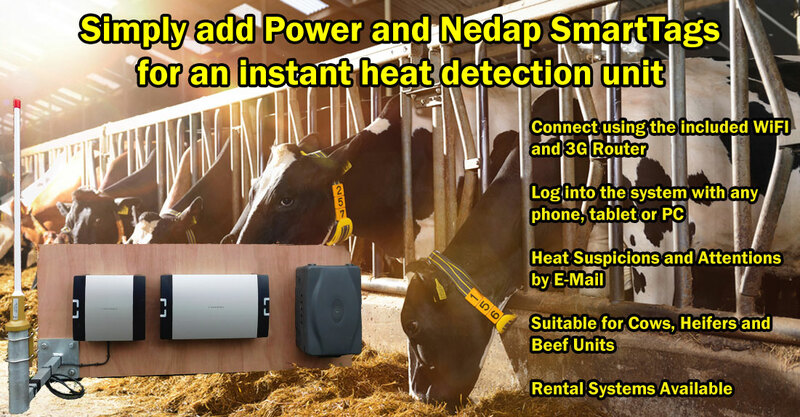 The Jenisys Portable Heat Detection system uses the world leading Nedap Velos equipment and makes it portable. All you need to add are Nedap SmartTags (Neck or Leg) and a 240V socket and the system is ready to go. Within minutes of being powered up the reader will have collected the activity data from all the tags in range of the antenna and sent them to the controller for analysing. After the first 7 days, whilst it builds a activity profile for each individual cow, the system then compares each two hour activity period with the corresponding average for the same two hour period to detect abnormal activity. As soon as two consecutive two hour periods show an increase in activity a “suspicious” attention is created, a third period converts this into a full heat attention. All functions of the Nedap Velos system are accessible in this portable unit. Measurements of Eating Monitoring, Rumination and Inactivity (Depending on the Neck Tag version); Standing and Lying time and Step Count (Leg Tag) will all generate attentions for abnormal behaviour. These attentions, and other information, is quickly and easily accessible either through the included WiFi network supplied with the system or via a free dedicated vpu-online account allowing access, worldwide, from any internet enabled device. Heat and other attentions can also be e-mailed for full remote operation. (The internet connection option requires a locally purchased 3G SIM card to transmit the data via mobile network). A rental option is also offered (subject to availability).